Home > Living > What Is The Best Whole House Water Filter? Have you ever taken a shower and got out feeling dirtier than when you got in? No one likes to take an unproductive shower or drink water that tastes bad. You can choose what town or county you live in, but you can’t always rely on the city’s water that comes with it. The results can mean bathing water that leaves a film on your body or your skin dry, and drinking water that has a bad aftertaste. 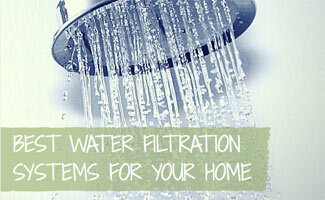 A solution is to install a filtration system that can help purify the water in your home. The Aquasana line of water filters is one of the most versatile and comprehensive solutions on the market. While the upfront cost is a little on the pricier side, it more than pays for itself over the long haul. Not only are the filters inexpensive to replace, they last a long time. The filtration system itself is also extremely reliable and dependable. The Aquasana Rhino water filter comes in a variety of capacities, but for the price, the 1000 is the best bet. The 1000 is certified to last up to 1,000,000 gallons and has a 10 year warranty. All of these factors make the Aquasana EQ-1000 our choice for the best whole house water filter. Each system comes with a number of add-on features like a UV filter, a salt-free softener and a sub-micron post-filter. One of the unique features is the upflow, dual tank design which increases the water contact time with contaminant grabbing media and prevents clogging or media channeling. The Aquasana filters are simple to install and easy to maintain. Backed by a guarantee and excellent customer service, the Rhino is a good bet when it comes to choosing a whole house water filter. Hard water has a high content of minerals including limestone, chalk and dolomite. While not dangerous to drink, it can lead to buildup of limescale which can cause corrosion or damage to your pipes. It can also cause your soap not to lather, resulting in scum. Eventually, the accumulation of lime can lead to blocks in your sewage lines, which can be costly to repair. Soft water is the outcome of removing the minerals and chemicals in hard water. The mineral ions that produce hard water are replaced with sodium ions. Having a higher sodium content in your water could harm houseplants, but shouldn’t affect your health since the amount is minimal relative to your overall sodium intake. You can “soften” your water, and minimize your exposure to sodium, by attaching a water softening system to the hot water line only, so that only half of the water you use is softened with sodium. How Can You Tell If Your Water Is Hard Or Soft? Notice if white residue builds up around your faucet or shower head. Get a home test kit for a more accurate result. We recommend the AquaChek Water Quality Test Strips from Amazon. They are easy to use and come 50 to a package. If you go the scientific route, there are two methods to measure hardness: grains per gallon or milligrams (or parts) per liter. Less than one grain per gallon or 17 milligrams/parts per liter is considered soft and over 7 grains per gallon or 120 milligrams per liter is considered hard. Do an at-home test without a kit using a water bottle filled with bath water and dish soap (as shown in the video below). If the water suds up after you shake the bottle then your water is soft, if it’s flat and leaves a white film, then it is probably hard. *These resources give a general idea of the water in your area and are not specific to your home. Why A Home Water Filter? Cooking – filtered water produces stronger flavors, quicker cooking times and overall better results in the kitchen. Even ice and coffee will taste better with filtered water. Better Drinking Water – chlorine-free drinking water is fresh, clean and great-tasting. It also removes harmful pesticides, metals and solvents. Softer Skin – results in less dry, flaky skin that can cause irritation and rashes. Shiny Hair – hard water can leave your hair feeling dirty and slimy whereas soft water will make your hair feel healthy and smooth. Cleaner Clothes – leave your laundry feeling fresh and smelling great by washing in better quality water. Protect Your Pipes – prevent your home’s valuable plumbing system from eroding over time by pumping only clean water through the pipes. Save Money & The Planet – eliminate the need for buying expensive and wasteful bottled water. Another thing to look for in a whole house water filter is whether it’s been certified by the National Science Foundation (NSF). The NSF provides industry standards based on product tests and audits. The NSF 42 standard specifically covers minimum requirements for drinking water treatment systems that includes “material safety, structural integrity and aesthetic, non-health-related contaminant reduction performance claims.” It’s not a requirement to have an NSF certification, but having this certification sets certain filters apart since they are endorsed by a government agency that has the public’s health and safety in mind. With so many whole home filters it can be overwhelming to decide which are the best. We reviewed the most popular, highest rated and widely used home water filtration systems on the market to provide you with enough information to find the right fit for your home. The Aqua-Pure Water Filter System is another solid option at a fraction of the price of our first place pick, Aquasana. The AP903 model is for city water while the AP902 is designed for well water. With a flow rate of around 75 liters (20 gallons) per minute, it’s built to support most larger homes or even small commercial properties. Made with non-corrosive stainless steel, it will last the test of time. The filter is integrated into the cartridge and requires no tools or contact with the filter itself to replace. Though the up-front cost is less, the filters are more expensive. Each filter will last you about a year. The Dupont WFHD 1300 features a universal system that makes it easy to upgrade filtration with other higher performing DuPont filters. It comes with a tank wrench to install tightly, but many users complain that it does not come with the mounting bracket which is sold separately (view on Amazon). With a water flow of 10 gallons per minute, it’s about half the flow rate of the Aquasana and the 3M models, but is a solid option for a small to mid-size home that has lower usage. Although the filters are inexpensive, because of their smaller size they need to be replaced every 90 days or so. This filter is a great value for the price. The Home Masters HMF2SDGC is a dual-filter system providing double filtration for maximum quality water. The dual chambers also make it a twice as heavy (over 30 lbs) so make sure you have a sturdy wall or stud to mount it to. The hefty size comes with a large 100,000 gallon capacity and high flow rate (up to 15 gallons per minute). The replaceable filters are easy to swap out and provide up to a full year of clean water for a family of four (View the Radial Flow GACC Carbon Filter on Amazon ). The Home Masters has high reviews but it’s unclear if the product meets the NSF standards. If you’re looking for a reliable, heavy duty filtration system this will be a great pick. Watch this video from This Old House as they install a whole house water filtration system in five minutes. There are a number of local and federal agencies including the Environmental Protection Agency (EPA) that regulate the standards for ensuring that our drinking water is potable and safe. Rest assured there are thorough checks and balances in place that make your water completely safe to consume before it ever reaches your home. In fact, city water is better regulated than the bottled water industry so your home water may be safer too. If drinking water comes from a private well, the homeowner is responsible for the safety. While EPA rules do not apply to private wells, some states may have well water safety rules. Either way, it’s recommended that well water users have their water tested annually. Now that you’ve read our whole house well water filtration system reviews hopefully you have a better grasp on the best filters on the market. If you are someone who has a handy man or a knack for home improvement, investing in a whole home water filter will not only add value to your home, it can have a huge impact on your everyday life. What solutions have you used to combat the issue? I like how in this article it mentions that water softeners cans remove the minerals and chemicals in hard water. My husband always filters his water. I have a hard time tasting it but I will look further into this as it potentially has many benefits. That’s interesting that you can check if your water is hard or soft by filling a water bottle with bath water and dish soap and then shaking it to see if it suds up or stays flat with a white film. The water in my new house doesn’t seem to clean as well as our last home so I’m trying to find how to check the water. I’ll have to do a test with a water bottle and then find a water filtration system I can buy that can help fix the problem. Connie, reverse osmosis used in the filters above removes most of the nitrate. If you are still concerned, you should consider distilling the water which is an effective process. A good friend of mine was looking into getting water purification equipment. He wants to know how you can tell if water is pure to begin with. It would help him a lot to know that the EPA will be making sure that all water, besides private wells, are safe. Any thoughts on the PurHome X-1000? Seems to have a higher quality filter and 10-12 GPM flow rate. Dave, we didn’t review that model but perhaps someone else who has it can provide their first-hand experience. I like your recommendation for the Aquasana EQ-1000 whole house filtration system. I am concerned about one thing – the water flow is rated at 7 GPM while other famous brands are rated at 10 to 15 GPM. Have you found this to be a problem with existing users? Jim, a bathroom or kitchen faucet has a flow rate ranging from 2-3 GPM so 7 is more than sufficient for the average home with 2-3 bathrooms. If you have a larger house with more sinks/faucets than that, you might be better off with a higher flow rate but the average gallons per minute for sinks and showers is around 2 so you should be good. Thanks Sadie – I do have a larger home with four baths and two kitchens with six people or more. We water trees and plants frequently. I like to find a system that features a bypass valve and a salt free softener. Do you have any other brands you could suggest? This system is really inadequate for good long term filtration. Culligan, Kinetico and Rainsoft whole house systems cost more initially but last forever and really do take out the contaminants. If you have hard water a softener is need with ionically charged resins. Chlorine and pesticides require a carbon based system and the most important filter is reverse osmosis for your drinking and cooking water These inexpensive systems don’t last or filter as well. Invest in a quality system with one of the big three US manufacturers who have been doing this a long time and avoid the cheap systems. how does the Aquasana do if installed after a typical water softener (culligan)? Still confused as to which one to get. The city has added a great deal of chlorine to our water which is not good for health and make sit hard to drink. Have you any idea of which one is the best to install overall? Hanne, they all have a similar installation process that requires you to interject the filter in between your existing pipes where the cold water line comes in to your house and before the water heater. However the DuPont and 3M models are probably the easiest of the ones listed above as they take up the least amount of space and extra parts needed. There are lots of online video tutorials that walk you through the process, but if you are not super handy or confident we recommend hiring a professional or plumber on Thumbtack or Angie’s List to help out. Thanks for reading and good luck with your whole home water filter decision! It’s the hard water that ruins you appliances, skin, hair, clothes. These filters do not help with that. You can add the descaler component to your Aquasana system which prevents build up of hard water minerals and therefore extends there life in a similar manner to the salt/potassium water softening treatments which are now suspect due to the addition of salt. Apparently this contaminates the water supply over time and for those on salt restricted diets the salt addition is not recommended. I knew there were a lot of benefits to having a good home water treatment but I didn’t know that it would actually protect the pipes in my home. Between that and the money I would save from buying expensive bottled water it makes a lot of financial sense to invest in a system like this. Thanks for the your water treatment guide and reviews! I live in Flint, Michigan where as you might have read in the news we’ve been having some drinking water issues with the city and lead leaking into our water! I am going to look into having one of these installed to see if that helps my drinking water situation! Thank you!